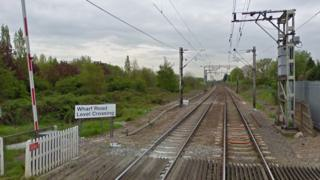 A boy has "life-changing" injuries after coming into contact with overhead power lines at a level crossing. The boy, 15, suffered serious electrical burns and was treated by the East of England Ambulance Service. British Transport Police say they were called to the tracks near Wharf Road in Wormley near Cheshunt, Hertfordshire, at around 17:25 BST on Monday. He was taken to Essex's Broomfield Hospital by air ambulance and remains in a serious but stable condition. Greater Anglia train services between Broxbourne and Cheshunt were severely disrupted by the incident. Officers say they are now making inquiries to understand the circumstances of how the boy, who has not been named, came into contact with the power lines.